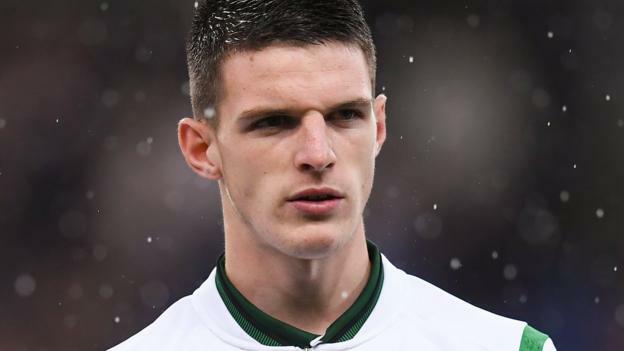 West Ham’s teenage midfielder Declan Rice says the decision over his international future will be “one of the hardest of my career”. Speaking to The Times, he said he has still not decided whether to declare for the Republic of Ireland or England. “Without a doubt, it is not an easy decision,” said London-born Rice, 19, who qualifies for the Republic via his paternal grandparents. Rice, who has impressed for West Ham in eight appearances this season, has three senior caps for the Republic but all have been in friendly matches, meaning he is still able to declare his allegiance to England. He has been omitted from Martin O’Neill’s last three squads as he continues to ponder his future, and confirmed he has been in communication with the Republic boss and his England counterpart Gareth Southgate. “Martin was excellent when he came to my house and Gareth was excellent and they both understand the position I am in. I said I just need some time,” he explained. Despite Rice saying he is no closer to a decision, O’Neill said he remained “hopeful” the youngster may still opt for the Republic. “He has got a lot of things to consider and you have to say a lot of those maybe favour England,” said O’Neill earlier this week. The Republic play neighbours Northern Ireland in Dublin on Thursday 15 November before concluding their Nations League campaign in Denmark four days later.